I think the bugs in my yard have some sort of alarm system that let’s them know when I’m outside. Within a few minutes they swarm me and leave me with tons of little red bites all over my legs and arms. It really isn’t fun to be munched on by insects. Seriously, sometimes when I go to the mailbox and then go right back inside, I’m covered with bites. Citronella torches definitely help the bug situation but I’m not a fan of the Gilligan’s Island looking tiki torches. 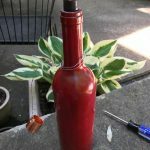 So taking inspiration from The Professor, I set out to make a DIY wine bottle tiki torch. 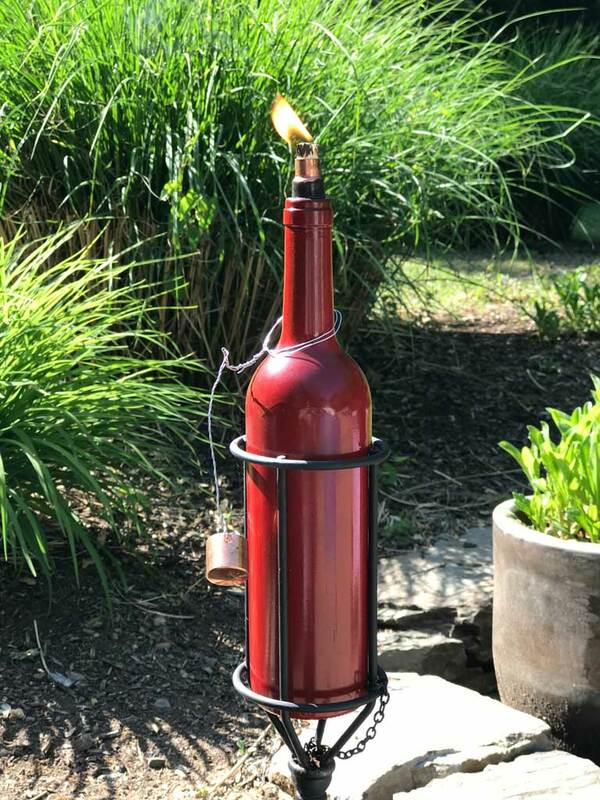 You’ve probably seen bottle torches pinned all over your friend’s boards on Pinterest but how many people do you know who have actually made one of these wine bottle tiki torches? I’ve made a bunch from Patron XO Cafe bottles and they work great. Put one on a picnic table or the bar and the bugs stop annoying you. But I have two black metal tiki torch stands that have been sitting empty around my pool for years. Every time I see them it’s a constant reminder of an unfinished project. So it was time that I filled those stands with something. And luckily enough, an empty wine bottle fit in there perfectly. The first thing I did was paint two wine bottles red to match my patio umbrellas. Definitely not required but I took a guess that I’d like the way they looked. And I guessed right. The red is a nice pop of color and as I said before, they match the umbrellas. Next I needed some wicks. They sell these as refills for other torches at most big box home improvement stores. You get two in a pack for like five bucks. The wicks are around 8” long and are 1/4” thick. 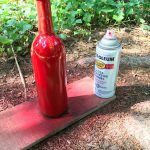 Perfect for a DIY Wine Bottle Tiki Torch. Now it was time to visit the plumbing department. 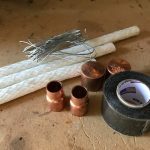 I needed copper plumbing pieces and started searching through all the boxes for the right sized couplings. One end needs to fit inside the wine bottle and the other end should snuggly hold a torch wick. Depending on your bottle you might need a regular coupling but I needed a reduction coupling. The end that fits inside the wine bottle should not fit tightly. It needs to be smaller so that you can wrap it with silicon tape. This rubbery tape creates a seal so that you aren’t leaking citronella torch juice all over the patio. We’re not making molotov cocktails, we’re just trying to repel some bugs. Skip the teflon tape and go with silicon tape instead. 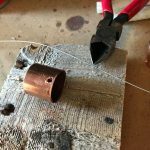 Wrap the silicon tape around the copper fitting until it’s thick enough to fit snuggly in the bottle. Most people will tell you that you should use teflon tape but I prefer silicon tape. It’s black and I think it would hold up better near the flame. They make pot holders, bbq gloves and stove to oven pot handles out of silicone now. And I have never ever seen a teflon pot holder. So there you go. To keep the wick from going into the bottle and to save on torch fuel, use some pea gravel in the bottom of the bottle. If you plan on leaving your wine bottle torches outside even when it rains then you’ll need some caps. Rain will soak through the wick and dilute the fuel until it eventually won’t light anymore. I drilled some small holes in plumbing end caps and ran a wire though it. The wire is so that I can connect the cap to the bottle and not worry about losing it. Wrap the wire around the bottle and leave enough slack so that you can easily take it on and off. And that’s how I made some a DIY Wine Bottle Tiki Torch. They repel bugs like regular tiki torches but in my opinion they look much cooler. © 2019 GoodStuffAtHome — All Rights Reserved.